If you fail to care for your trees and they damage another person’s property or injure someone, you could be liable for the damage. Don’t risk it! 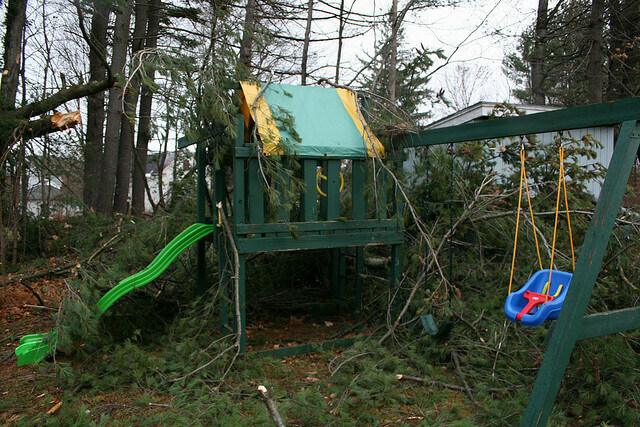 At Mr. Tree and Lawn Service, we provide affordable, knowledgeable tree services in Gainesville so you can keep your family, property, and neighbors safe. Read on to learn what to look for so you can identify problem trees in your yard, and call us today at (352) 682-4444 to set up a free estimate today. Tree has brown leaves and dead wood at crown. Tree is leaning, especially if the roots are exposed or you can see visible swelling/mounding at the base of the tree opposite from the direction it’s leaning in. Tree’s branches grow in different directions which causes them to rub against each other. Tree has damaged bark or scars from being hit (by construction equipment, for example). Base of tree has mushrooms or ants, which could indicate decay. If your tree is displaying any of these warning signs, call us ASAP! Our tree service professionals will evaluate the tree and either recommend tree removal, or suggest a way to save the tree through trimming, anchoring, or some other remedy. Of course, even with regular tree care, trees and branches can fall in unfortunate places. If you have a downed tree on your property, call us for emergency tree removal.